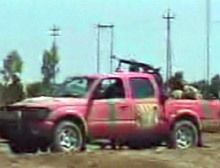 The Iraqis taken prisoner were driving a pink pickup truck with a machine gun mounted on it. (CNN) -- Members of the U.S. Army 7th Cavalry's 3rd Squadron in south-central Iraq battled a battalion-size fighting force of the Iraqi army Sunday but remained ahead of schedule in the march to Baghdad, the Army unit's commander said. CNN correspondent Walter Rodgers has been traveling with the 7th Cavalry's 3rd Squadron. He spoke with CNN anchor Carol Costello about Sunday's battle. COSTELLO: What happened in the incident with the 7th Cavalry? RODGERS: The 7th Cavalry was moving up the road, approached the outskirts of a city, an Iraqi city in south-central Iraq. They began to take some small arms fire. We're not sure how substantial the fire was because the Bradley armored fighting vehicles were far in advance of us. The commander decided to stop the column, put it on the side of the road. They called in artillery. The artillery pounded the Iraqi positions. The smoke has been rising from the targets of the U.S. artillery. It was burning much more furiously 45 minutes or so ago. The Iraqis were pretty well pounded down. But again, 7th Cavalry has not gotten its orders to go forward yet. At least three Iraqi prisoners were taken. They were put in squatting, sitting positions beside the road. Army interpreters were interrogating them. They all seemed quite jovial. It was a rather friendly conversation. The Iraqi POWs were given bottles of water. They were wearing black uniforms. That doesn't tell us anything about their unit. And what happened was another Iraqi soldier, again, in that group, was wounded. The U.S. Army medics took him to one of their trucks, one of their armored vehicles. The Iraqi soldier was being treated. I cannot tell you his condition. He was too far away, 50 meters away, and we couldn't go off after him. The Iraqis who were taken prisoner were driving a pink pickup truck with a light machine gun mounted on the back of that when they were put out of business. They must not have put up much resistance; otherwise they would've been taken out very, very quickly. COSTELLO: Tell us more about this pink pickup truck, that must have been a bizarre sight for the troops. RODGERS: It was, indeed. It was a pink pickup truck, your normal Japanese issue. But the Iraqi soldiers had mounted a 7.62-millimeter light machine gun atop that. Palestinians have been doing that for years when they were in Beirut. And on the right corner of the windshield, there was a [New York Police Department] bumper sticker pasted up.